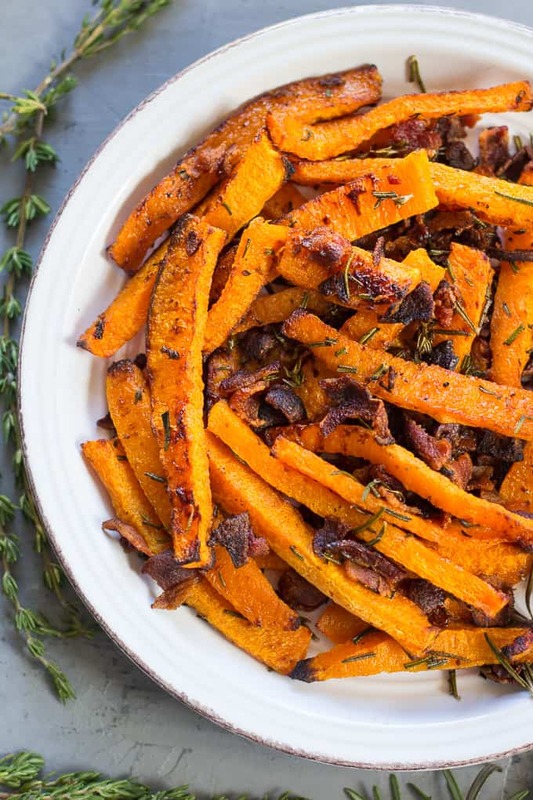 Simple but incredibly delicious roasted Rosemary Bacon Butternut Squash Fries that make a perfect side dish with any meal. 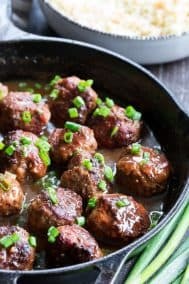 Paleo & Whole30 friendly – kid friendly too! Can we just talk about my love for fries right now? Or, rather, (because I wouldn’t want to be selfish) YOUR love for fries right now? 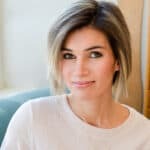 According to my daughter Emily – EVERYONE loves fries. We know that already. Nothing new here! Except, these fries are special. I promise! But how? For starters, you should probably know that after making and photographing these fries, I ate the entire plate for lunch and didn’t regret it. Not one bit! 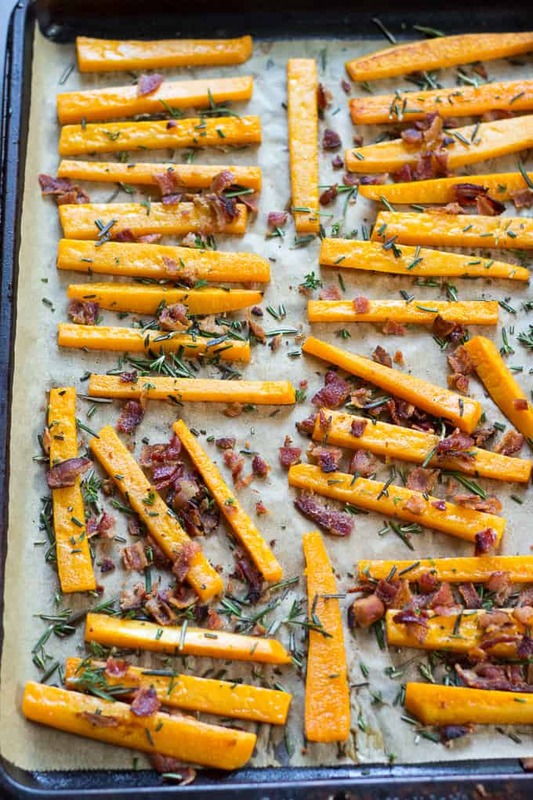 In fact, I think the combination of bacon and rosemary is a new favorite – especially when crisped up in the oven, and of course, eaten with FRIES! 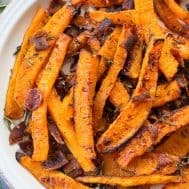 As much as I’m obsessed with roasting “fries” made out of sweet potatoes and squash, there was a time when I had no clue how to make these veggies crispy enough to be considered fries, in the oven. I was definitely determined and did quite a bit of experimenting! 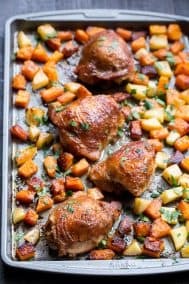 What I eventually came up with is the method I’ve used for years now and it can be summed up like this: the “right” amount of fat, parchment paper, LOTS of breathing room in the oven, and a high temperature. 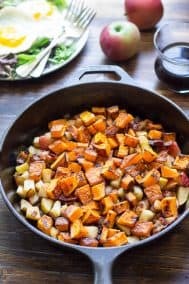 I’ve found that the right amount of fat varies based on what you’re roasting – butternut squash can’t handle as much as Japanese sweet potatoes, which need significantly more for a crispy texture. Too much fat leads to soggy fries, too little and they’re dry. 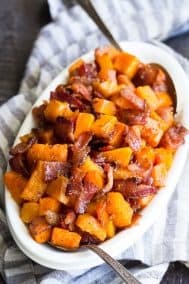 I used to try to roast butternut squash alongside bacon, but found I couldn’t control the fat as much and would wind up with soggy fries. 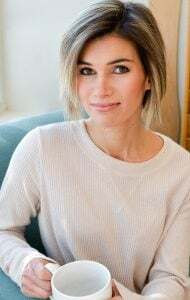 For this recipe, you’ll add the mostly-cooked bacon, plus the rosemary, a little more than halfway through roasting for the perfect amount of “crisp” for the bacon and rosemary once done. 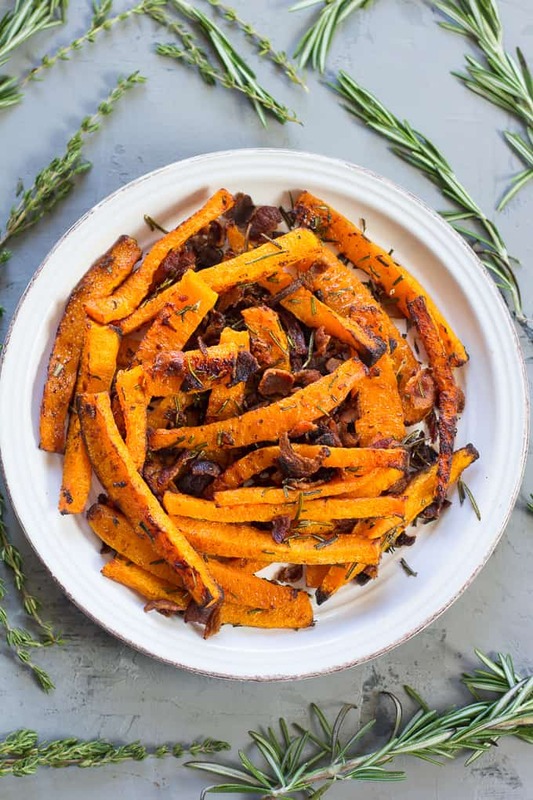 The result is seriously addicting butternut squash fries that make a great side dish for any meal, and are especially fun to make during the holidays since they use rosemary, which elicits all sorts of warm fuzzy holiday memories for me. I’ve been known to buy fresh rosemary just so I can stand in my kitchen smelling it. This time of year, I chop it and put it in practically everything I make. 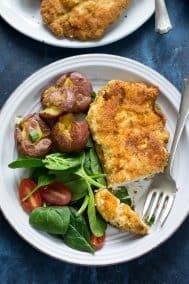 And it’s SO good all crisped up with veggies, or chicken, or meatballs! But yes – our collective love for fries. Sort of like the collective unconscious, right? And collective love for savory, crispy (or creamy), nourishing food when the weather gets cold? The collective comfort food unconscious! 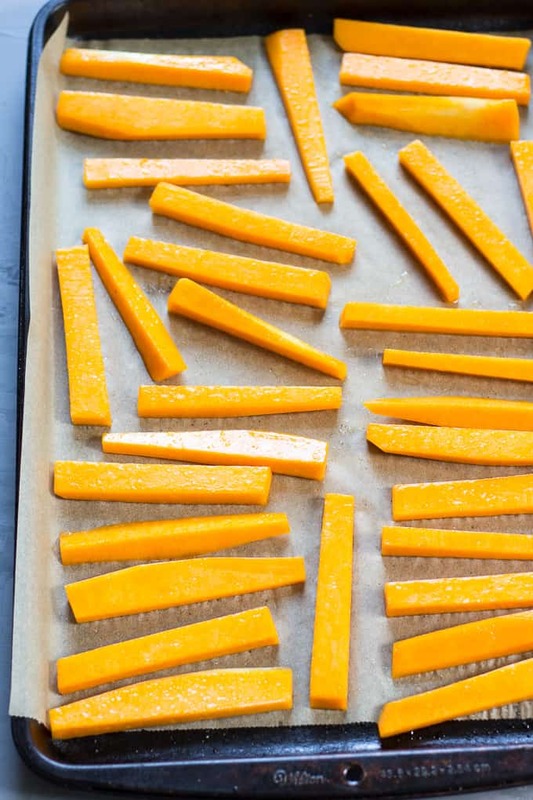 I feel myself going way out there now, so, let’s redirect back to the butternut squash fries -and start cooking! 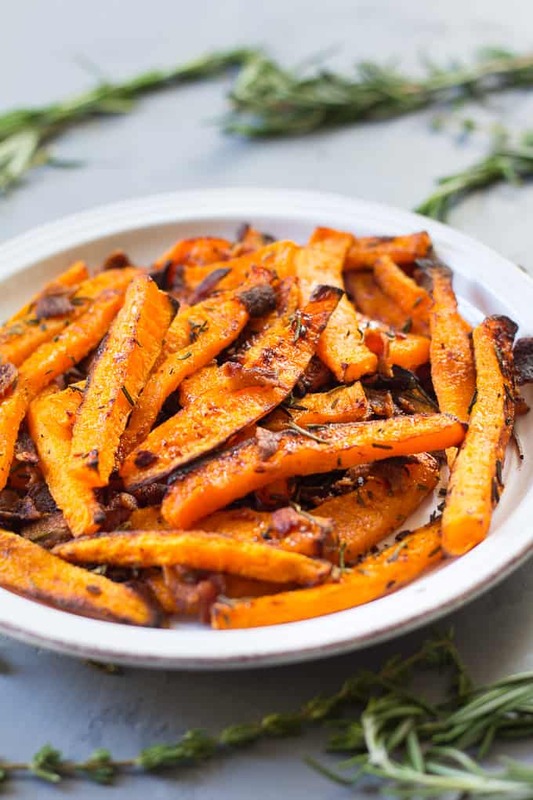 Simple but incredibly delicious roasted Rosemary Bacon Butternut Squash Fries that make a perfect side dish with any meal. 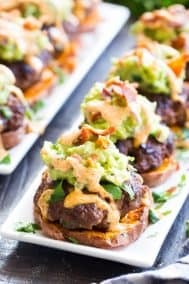 Paleo & Whole30 friendly - kid friendly too! Using a large sharp knife (this one is my favorite for cutting squash!) cut the long, peeled part of the squash into 1/2" fries. 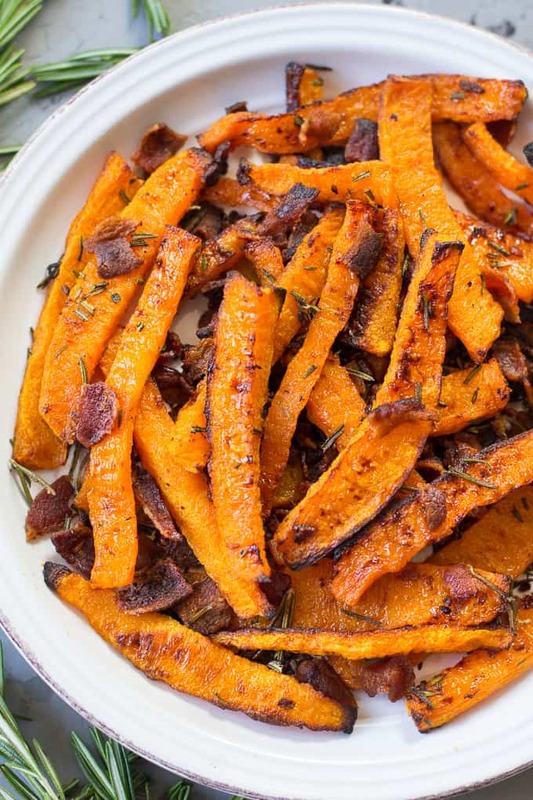 Butternut shrinks quite a bit when roasted so make sure you don't cut the fries too thin. Put fries in the oven, then heat a heavy skillet over med-hi heat to cook the bacon*. Add the bacon pieces to the skillet and cook until browned but not too crispy - they will cook with the fries for the final part of roasting. Once about 3/4 done, remove with slotted spoon and drain on paper towel. After 20-25 minutes of roasting the fries should be beginning to brown. Remove from oven and sprinkle with the bacon and chopped herbs, then return to oven. Continue roasting for another 15-20 minutes or until browned and crisp. 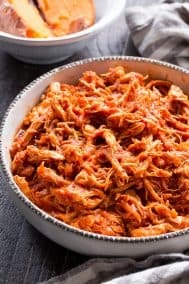 Remove from oven and serve hot. Enjoy! 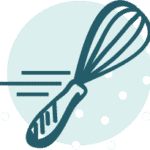 *You can use rendered bacon fat if you cook the bacon prior to roasting the fries, otherwise, melted coconut oil or olive oil are fine. 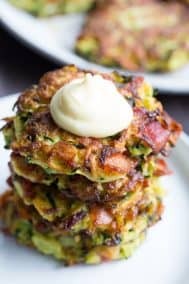 Want more easy Paleo & Whole30 side dishes? Try one of these! Fries are magical. They hold all sorts of (mental) healing powers in them, and I think these from butternut squash look fantastic.